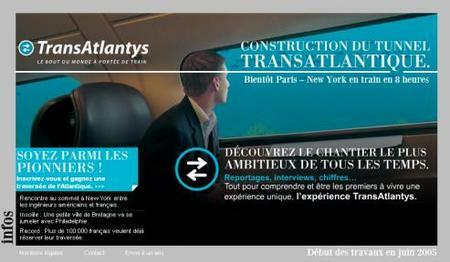 The newspapers one gets by the metro here had a big fullpage ad yesterday about Transatlantys. Essentially the announcement of the grand project of building a transatlantic tunnel, from France to America. Paris to New York in train in 8 hours. Work starts this month. And you can win tickets. Sounds great. Except for that it doesn't exist. It is some kind of hoax, or a game, or a gimmick to promote something. It isn't quite clear what. The elaborate website doesn't give a hint. Best guess seems to be that it is a viral marketing campaign run by SNCF, the company that runs the French train system, as they seem to be the owners of the domain. It says o the ad "Because you can't go everywhere by train, SNCF also proposes flights, hotels, etc." retreat route, next time france is invaded.